A lot of the early comedy arises from our Joseon 4’s fish-out-of-water reactions and antics. I found it laugh-out-loud funny and highly entertaining. The writers managed to pick some of the most mundane everyday things from modern life and turn each one on its head from a Joseon point of view to bring the funny. One of my favorite bits is when the Joseon boys go to a mini mart and encounter modern money for the first time. I totally didn’t expect them to fall face-down on the floor in reverence, upon seeing the image of the king! That was a stroke of pretty clever writing, I thought, because when you think about it, the Joseon boys’ reaction is perfectly understandable. Yet, I never saw it coming. Nicely done. Of course, some of the gags are more successful than others, but really, I was very amused at the Joseon boys and their various misadventures. I mean, seriously, who doesn’t see the funny in something like this? Park Yoo Chun is royally imperious to hilarious effect, and he and the rest of the boys bring the funny with their reactions to everything, which are in turn horrified, puzzled and just plain confused. Han Ji Min provides a nice foil to the comedic antics, and grounds the story from becoming too slapstick. I really enjoyed some of the quieter story beats that were between Yoo Chun’s Yi Gak and Han Ji Min’s Park Ha. They would tend to start out bickering and comedic, but would often turn into a sweeter, more quiet moment. The chemistry between our OTP was very good, and I enjoyed their scenes together very much. One of my favorite motifs between our OTP is the whipped cream, which represents comfort. When it’s first introduced, it’s innocuous, and even has a bit of a sight gag flavor, with both our leads looking adorably ridiculous with mouthfuls of whipped cream. But that turns into something sweeter and more meaningful when he brings her whipped cream again in a later episode when he realizes that she’s upset. Another thing that I found very endearing was how Park Ha and the Joseon boys became a family. Through all the funny and also in the midst of all the evil plotting by the bad guys, the bonds among this motley crew continues to grow and strengthen, and lends such a heartwarming flavor to the show. Rooftop Prince is a show that was a little uneven here and there, and some of the plot mechanisms were flat-out flimsy. I mean, so much rested on how lousy a villain Tae Mu (Lee Tae Sung) turned out to be? That required some serious suspension of disbelief. But, there is a lot to like in this show. The funny is underscored by warmth, and then the story evolves into an epic love story that transcends time. The last few episodes were especially poignant. When Yi Gak started to have his fading fits, a sense of sadness and inevitability underscored the romance, which had blossomed by then. That he was looking lovingly, right at her, while in the same moment, she was stunned speechless as she watched him fade in and out of sight? That just got me right in the heart. But it was the end of episode 19 that moved me the most. The wedding scene was so moving and so poignant. In that kiss, their tenderness and wistfulness was so strong that you could practically touch it. It was so real and in the moment. The entire scene was lovely and bittersweet and beautiful. I have to agree with everyone else that Yoo Chun’s acting has improved tremendously with this role. He was a lot more confident and faceted compared to his outing in Sungkyunkwan Scandal. He got to play so many variations of the same character, which demanded a lot of nuance from him, and he delivered. I was pleasantly surprised. I also have to agree that he grows on you. By the time we were nearing the end of the show, I really liked him. Not in a fangirl crush kind of way, but I really did like him. Han Ji Min and the rest of the cast were also very good. Lee Tae Sung was rather stiff, but that didn’t bother me too much. I was most taken with the love story of our OTP, so I could overlook a little stiffness from our resident villain. 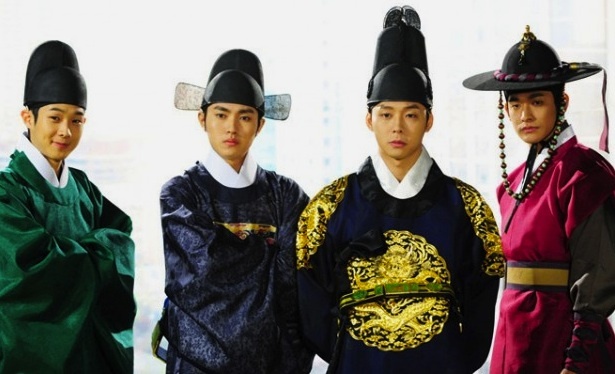 Rooftop Prince started off centering around the Joseon boys but ended up really being about the love between a Joseon prince and his true lady love. The ending was vague but there were leading details included to help viewers find their own conclusions. I like to think that at the end, it was Yi Gak standing before her. So I think that’s to prime us as viewers to accept that regardless, it’s the same soul. Yet, I do think the little clues were meant to show us that Tae Yong’s really a lot more Yi Gak now. Like, how he stands with his hands behind his back like Yi Gak always does. And no more glasses too. And his way of looking at her, with a knowing look. And then what he said, “What took you so long? Do you know how long I’ve waited?” seemed to hint at the 300 years. And the fact that they joined hands immediately and tears started to run down their faces. That’s a bit of a clincher. It would make no sense for Tae Yong to behave like that, so it’s more plausible that it’s Yi Gak standing in front of her. And then he stands before her in his kingly robes. I like to think of it as Yi Gak managing to find his way back to her 300 years later, as a testament of their love. Someone also said that Yi Gak’s mission when he time traveled was to marry Park Ha, to join their souls together, so that he could find her again. I like that take as well. Although he thought his mission was to solve the princess’ murder, it really was to meet Park Ha and be joined to her for all of eternity. So even though Bu Yong had died to save him, he still found their love in another dimension, and found his way back to her side eventually. That is how I choose to look at it, because I like to think that their love was that epic. Rooftop Prince lingered with me a little. I found that it wasn’t as easy to move on as I had expected when I first started this show. The sticky quotient is definitely there for me. Flawed, but serves up a poignant, pretty epic romance. I love this drama to bits! And it’s another reason why I’m not 100% eager with I Do I Do because I just finished this one and this drama DOES LINGER – a lot! I actually had no plans of watching this one, but saw a short clip showing language clashes when the Joseon guys use ‘old Korean’ in 2012 Seoul so I was curious. Sigh, usually when I start a drama just because of a very little curiosity and no expectations, they turn out to be the best ones (in my book, at least!). And those that I am so looking forward to/had some/high expectations would sometimes turn out to be a disappointment. Anyway, going back. Yoo Chun was also a revelation to me. With my almost 0% to kpop, I didn’t know who he was. Really. I was impressed with his performance, so I googled the drama and that’s the only time it dawned on me that it was THE Yoo Chun my classmates were spazzing over! I also find the ending satisfying. I was really worried because we all want 박하 and 이각. Some fans were even wishing that it will be Tae Yong who’d be sent back to Joseon (that would be really funny though! hahaha. could be a whole new drama by itself – you wake up one day and everyone treats you as a prince!). And how the ending was executed is good enough for me to buy that he is still 이각. As much as 박하 is still 부영. It’s just sad that only 박하 can receive a letter from 이각 but he will never ever be able to get a reply form 박하. 그렇네요… I also can’t imagine any other Sam Soon aside from Kim Sun Ah (I heard the first actress declined to gain weight for the role, but they did not name who it was). Nor Ryu Shi Won as Jo Guk. I didn’t know Jang Hyuk was supposed to be Joo Won! Joo Won is Hyun Bin. Hyun Bin is Joo Won. They are a match made in heaven! And yeah! That 만원 really sold me! And I didn’t see it coming either. Also when he went to a palace and ordered to have the door opened for him. I saw that coming but it never stopped me from lmao! Then I forced my friend to watch this and she experienced the same thing; that the drama left her a bit depressed and that it was hard for her to move on, LOL. But I fully agree about how it was LG whom PH met at Seoul Tower. I mean, yes, he’s also Tae-yong but only in the physical aspect. All the little quirks, like the lopsided smirk, it was all LG. That made me ridiculously relieved. And btw, I’m watching Queen In Hyeon’s Man now. Once again, thank you for reviewing! Yes, all the clues point to it being Yi Gak standing before her, and I choose to believe that it IS him, coz otherwise the ending just doesn’t work for me.. In a sense, it’s good that it’s left to our interpretation, so we get to choose what we make of the clues laid out for us. When I chose to believe it was Yi Gak, the entire romance took on such epic proportions for me that I was quite taken with it. It stuck with me and I kept thinking on it for a while. “Yet, I do think the little clues were meant to show us that Tae Yong’s really a lot more Yi Gak now. Like, how he stands with his hands behind his back like Yi Gak always does. And no more glasses too. And his way of looking at her, with a knowing look. damn. I was really shocked when he did that hand gestures.. and those “What took you so long? Do you know how long I’ve waited?”… And when I think about it, I get depressed and disappointed because I can’t really move on that easily after watching a kdrama… The drama left me wanting for more and questions are getting on me.. GAH! and I really ship Yi Gak and Park Ha more than Tae Yong and Park Ha.. I think in the end Tae Yong knows that he is Yi Gak, and that Pak Ha realizes it too. Exactly like you said, the way Tae Yong was standing with his arms behind his back and the way he reached out his hand to Pak Ha were very formal like Yi Gak. Also his tone of voice and way of speaking when he asked her why she was so late were like Yi Gak, and not like Tae Young in the beginning (and no glasses). All of that plus, just as you said, the way he was looking at her with tears running down his face shows, to me, that Tae Yong remembers everything about who he was (and still is) and all about his time with Pak Ha. And even though he had to live the rest of his first life without her he got to remember everything and be reunited with her when he (as Tae Yong) came out of the coma. I saw a documentary a long time ago about a few real life cases where some people who have been in comas, or have had some kind of head trauma, have suddenly remembered strange things when they woke up like knowing other languages, or how to play instruments, that they never learned in their present lifetime. So something like this could explain why he remembers everything about his first life while the other reincarnations, including Pak Ha, don’t remember theirs. But everyone I have presented this take on the ending to have told me that Tae Yong doesn’t actually remember being Yi Gak, he is just drawn to Pak Ha because of his past life, and that he’s crying at the end because he is so happy to see her again after meeting her before he ended up in the coma. And she is just happy because Tae Yong looks like Yi Gak and she is happy to be reunited with Tae Yong after their brief meeting in the beginning. And that maybe their spirits somehow recognize each other, without “actually” recognizing each other. But like you said, Tae Yong acting like that at the end wouldn’t make any sense! Their brief contact at the beginning of the story wasn’t nearly enough for him to have that strong of a reaction at the end without having remembered that he is (was) Yi Gak! And her reacting to him so strongly just because he looks like Yi Gak, and because of their brief first meeting, really wouldn’t make any sense either! I don’t know how to start this comment, to be honest. I can’t find the right words how to express how I loved this series. It has been my favorite ever since and I’ve been a fan of Ji Min and Yoochun since then. Great review! 🙂 Love this pictures. One of my favorite scenes was when Park Ha bought a ring for them, his face was like “high and mighty” when she was putting it on her finger but smiled childishly when she was not looking. ♥♥♥ The wedding is really heavy. I had to pause my player to stop myself from crying and continue watching because I couldn’t see with tears falling. Haha. Aw, I can totally feel your love for the show, glitterweaver! 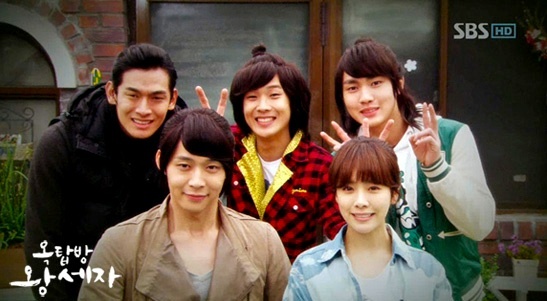 😀 I really enjoyed Rooftop Prince, and beyond the funny bits, it was the heartfelt scenes that really lingered with me. That wedding scene made me cry, seriously. Both Yoochun and Han Ji Min were great, and I really enjoyed their onscreen partnership. After I finished this show, I actually found it kinda hard to move on, and that doesn’t happen to me all that often, that’s for sure! The series is ok but there are things I notice that too much exaggerate in the character of “Park Ha” there’s no way a person would stumble every bit of information of all the character in the series and have all the solution to disrupt their lives. And the main character the director made them super stupid, think of it….. you don’t check, you don’t ask, you never investigate…. the main character is more dumb than a retard. Maybe the director is like that in real like DUMB and pattern the series to his image. Todays life series maker make it a little real than to exaggerate because viewer and wiser now so director should step up more better and stop making lead character stuid.